The February 10-11th Lunar (Full Moon) Eclipse in Leo represents the opening of a new gateway and a starting point into the energies of 2017. Eclipses act like doorways into different energy paths, and are powerful enough to transform, shift and change the direction and flow of your life. The last eclipse was in September 2016 and February’s Eclipse is going to bring an end to whatever energy was brewing at this time. This ending is to pave the way for a new beginning, which will come at the end of the month on the New Moon Solar Eclipse. Lunar Eclipses are always viewed in astrology as being deeply transformative times that can bring abrupt and sudden change. While this is true, there is another side to Eclipses that is important to remember. Eclipses are like the cosmic helping hand of the Universe. Imagine the energy of an Eclipse like a Universal hand that reaches down from the heavens and puts you where you need to be. The good thing about Eclipses is that generally you can trust the direction they are guiding you in. Eclipses bring about almost fated events that are part of the cosmic plan and written just for you. 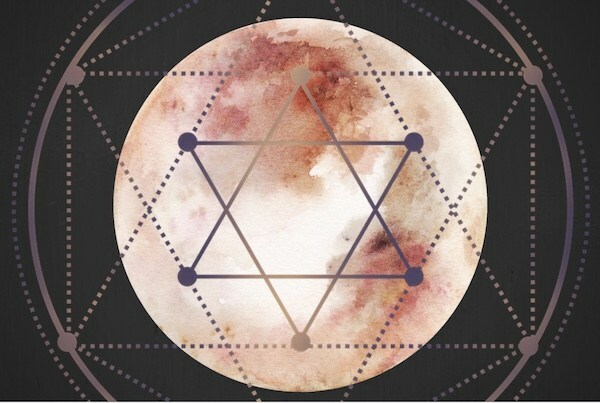 The writing is definitely in the stars for this February Lunar Eclipse, due to the fact that the Moon also makes a sacred pentagram pattern with other planets. It is very rare for the celestial bodies to arrange themselves in the shape of a pentagram or star, but this indicates a lot of luck, harmony and Divine synchronicity. In fact, whatever comes your way around this Eclipse is likely to be resolved very quickly and the odds are likely to fall in your favor. This Eclipse energy feels very fated and illuminating, almost like the Universe is drawing your attention to a particular area of your life for a very specific reason. Seeing that the Eclipse falls in the sign of Leo, there is going to be a fiery element to this Full Moon as well. This energy is going to help push things along but it is also going to provoke abrupt endings. If something needs to be gone from your life, if something needs to come to an end, this Eclipse is going to set the wheels in motion. 2016 was very much a year of endings. Endings are necessary in order to make way for the new and this Lunar Eclipse is like the final purge of 2016. Whatever you needed to let go of, whatever changes you needed to make, this Eclipse is going to ensure that it happens. This is a powerful eclipse, but it is also extremely magical and protective. Change will happen but it is definitely going to be change for the better. The energy of this Lunar Eclipse will last until August 2017 and will open a new gateway of energy that is productive, active and positive. Leo represents the King of the jungle, so it is likely that this Eclipse energy will allow you to stand up and take ownership of your life so you can become the Queen or King of your own jungle. As things are brought to the surface around the Eclipse, try to embrace it and remain open to whatever comes your way. Eclipses are powerful teachers and are like a direct calling card from the Universe as to what we need to release from our lives and what we need to bring into our lives. The pentagram formation of this February Eclipse is going to ensure that our lives are put into perfect balance and symmetry. It is also going to ensure that we have the tools we need to move forward into 2017 with confidence and a fresh perspective. This Eclipse marks the first for the year and is going to be an incredibly powerful and magical guiding force. Trust whatever unfolds and know that it is all for a much higher purpose, know that whatever unfolds was written in the stars. This post was republished from foreverconscious.com.